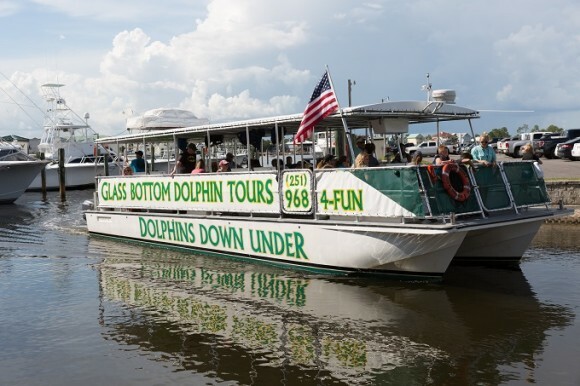 Dolphins Down Under "Glass Bottom Dolphin Tours"
Join us aboard our glass-bottom catamarans which are the most stable boats around and have four large glass panels to view the dolphins if they happen to play and swim beneath the boats. Let our knowledgeable captains and crew guide you and your family on an exciting, informative 1 ½ hours quest in the smooth, pristine waters of the Gulf of Mexico and back bays. You will also see other wetland creatures and birds in the area. There are restroom onboard, a snack bar and fitted life vests for children and infants. Infants must weigh at least 18 pounds for safety regulations and proper fitting life jackets.